JSaxx is available for clinics, masterclasses and demo presentations at schools and local music stores. Visit his web site for his performance calendar and to schedule a clinic, masterclass or presentation. BIO: John “JSaxx” Watkins, born in Cleveland Ohio developed his love for music at the early age of 8 listening to his father Rev. John C. Watkins, his uncle Lamar Gaines and his grandfather Charles Pace. Following in his family’s footsteps JSaxx picked up the saxophone and never put it down. John “JSaxx” Watkins sound truly represents that common fabric that unifies all music across many mediums, from traditional Jazz to old school R&B, fusion and pop; music that reaches all generations and age groups from both ends of the spectrum. His sound presents a new platform laced with a familiar touch of the old, connecting all genres of music through one unified platform. JSaxx has shared the stage with numerous artist such as the Whispers, GC Cameron, Johnathan Butler and the Temptations. He has also performed at the Black Heritage Festival in Kentucky and a musical production play starring movie actor Leon. JSaxx landed the cover of Lifestyles Magazine in 2012, In 2013 his debut Jazz single release “In My Soul” which is still currently being aired on 107.3 the Wave. In 2014, John “JSaxx” Watkins showcased the launch of his solo career at the Beachland Ballroom in Cleveland Ohio in front of a sold out crowd. JSaxx released his second single “Acid Rain” the second quarter laying the ground work for an impressive launch to his career. 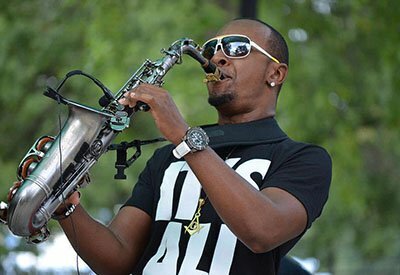 JSaxx performed at the January 2016 NAMM Show in California, JSaxx became an endorser for Dakota Sax saxophone, Theo Wanne Mouth pieces and Legere reeds. In February 2017 JSaxx opened and performed with Jonathan Butler in Los Angeles California. In April 2017 McDonalds featured JSaxx on the Rock Box McDonalds Commercial.